I got the last 9 vertical seams sewn yesterday afternoon and last night sewed 8 horizontal seams. All of the rest of the rows are webbed to the sewn section. My granddaughter brought the 2 great-grandsons to my house and we walked to the closest city park. It was a beautiful day to be outside. I planted another Shasta Daisy before they got here and went out and pulled tons of Creeping Charlie after they left. 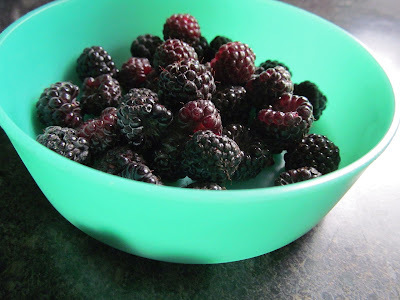 I noticed some black raspberries had ripened and was surprised when I started picking them how many there were. I had them over ice cream last night. I noticed a Japanese Beetle on the bush. I sure hope we won't have a lot of them this year. 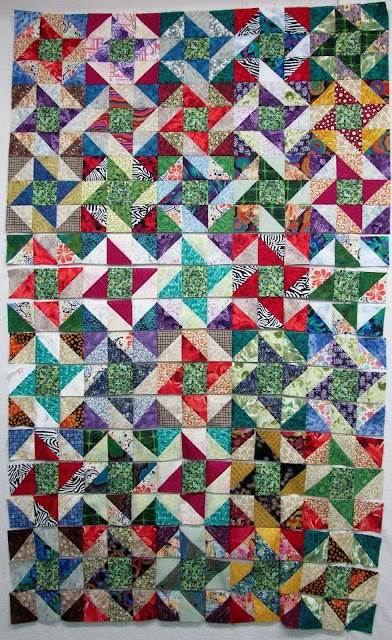 Nice progress on the quilt... always nice to find edibles in the garden!!! Found some Japanese Beetles too... I sprayed them, in the late evening... no bees to poison when the sun is going down. The quilt is looking good. My those raspberries are what really catches my eye. Yum! I think all the beetles are at my Mom's house. She is inundated. I hope your neck is better. Oh my, I sure hope we don't get those beetles here, they are really awful. Those berries look delicious. It sounds like a busy day for you. The berries look delicious - such a summer flavor! The quilt top is coming along. Those raspberries look tasty! quilt is lovely Great job...Now r u sure you did not eat a crispy beetle in that ice cream!!! Sounds like a very good day.